The Department of State Services (DSS) has asked President Muhammadu Buhari to prosecute Adams Oshiomhole, National Chairman of the All Progressives Congress (APC), for allegedly receiving at least $55million in bribes before and after the party primaries all over the country. In October, SaharaReporters had reported how Oshiomhole and his cronies received up to N50million in bribes to award last-minute tickets to undeserving members of the party. The DSS subsequently grilled Oshiomhole last week, with reports emerging that the former labour leader had been asked to quit the office. 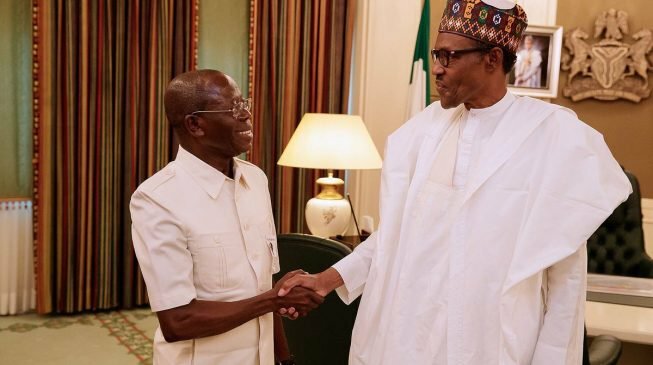 It is unclear if Buhari will follow the recommendation of the DSS for Oshiomhole’s prosecution, as SaharaReporters understands there is pressure from Bola Tinubu, National Leader of the APC, and Vice President Yemi Osinbajo, to give the former Edo State Governor a soft landing.